Check in to this treasure trove of inspiration. 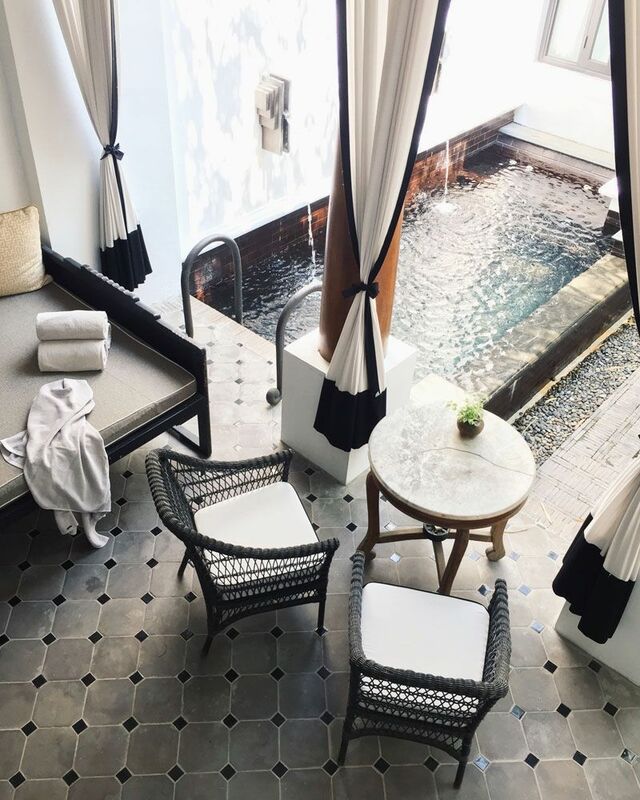 Bangkok isn’t exactly the place that comes to mind when you think of a "peaceful getaway" but here’s where you can bask in the best of both worlds: The Siam. The stunning boutique hotel allows you to dip into the buzzing scene of Thong Lo then escape to a sanctuary just a 30-minute boat ride away. When it launched in 2012, only a handful of travellers ventured to this side of the Chao Phraya River. The urban retreat, however, has become a destination in its own right largely because of its unique, alluring design. The welcome alone is impressive: ascend the stairs to the lobby and you’ll be greeted by a leafy courtyard, charming restaurant, as well as a smattering of antiques. Trust us: you'll be spending a substantial amount of time photographing the expertly styled vignettes. The Siam is a must-visit for anyone with an interest in design. It clearly embodies the vision of owner who wanted it to be a “larger work of art” to house his collection of antiques (of which only 30 percent found its way into the hotel). The striking architecture, black and white palette, and colonial feel is perpetuated throughout, with some rooms emulating the glamorous Art Deco era. Our pick? The wonderful Pool Villa Courtyard seen above. Nature finds pride of place here at The Siam, a testament to the ingenious, masterful design of Bill Bensley. The entire compound incorporates greenery cleverly but the highlight is the installation-like atrium where the foliage is clearly the star. The main buidling wraps itself around a lush setting of tropical plants, making every angle Instagram worthy. You’d be hard-pressed to find a reason why you’d trade in the luxurious surrounds at The Siam for the chaos of the city. There’s a library with an adjacent cinema (perfect for viewing classic films), a pool table, a lap pool (pictured) and of course, the indulgent Opium Spa. It has also placed emphasis on the food— the breakfast spread is top-notch and the restaurants offer authentic, enticing Thai dishes. If Bangkok beckons, make sure to have sundowners by the jetty just before you board the private boat to the city. The Siam is celebrating its 5th anniversary in 2017 with offers here.